BG-02, Ground Floor, KL Industrial Park, No. 653, Batu 5, Jalan Kelang Lama, 58200 Kuala Lumpur, Malaysia. Chan A Yab Enterprise Sdn Bhd was incorporated since 1993 and we have since accumulated more than 20 years of experience in this industry. Over the years, we have gained the trust of our customers by providing reliable and honest service. In return, we have been receiving the constant support from our many satisfied clients. 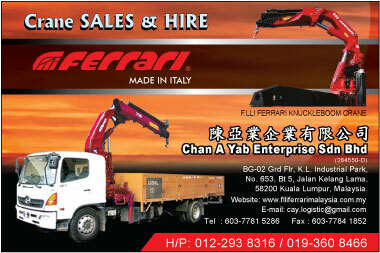 We are also proud to be working with Italy’s leading transport agent Flliferrari Company, where we are their authorized transport agent in Malaysia. Our main business involves handling machines, cabin removal of all types of Heavy Equipment & Materials in Project Site.